Over the years, we had many zoological visitors. Some were probably always present, others were seasonal visitors and a few were just seen once or twice. Possums – lovely from a distance but not good on the roof! Schoolyard games seemed to have irregular cycles. Yo-yos, jacks, marbles, swap cards, skipping, hula hoops were all popular at various times of the year. Not every family could afford them all of course, so there were always some performing and others watching. Those who had the fancier yo-yos could make them do impressive tricks whilst the rest of us had to be content with more basic movements. The “yard” was a fenced area beside the house in which the younger children in the family could play. There was a plum tree and a swing and room to run around. OK, I’m cheating here a bit, but an axe was a very important tool during my childhood. Without an axe to split firewood we would have had no cooked food and no heating in winter. Dad used a chainsaw to cut the logs into sections but an axe was needed to get it to a useful size. If Dad was busy with other farm tasks, when the wood ran out, Mum went out and split it with the axe herself! A sort of cheat here too. I remember our grade 6 teacher telling us that we would be learning a new subject called algebra in high school the next year. I was quite intrigued by his explanation about using the letters “x” and “y” instead of numbers and looked forward to this interesting new challenge. Giant worms are not something you see every day. Some of them live in very damp areas near the creek at the bottom of our hill. They rarely come to the surface and so are not often seen. Sometimes people have heard a gurgling sound as they have moved along their tunnels. Not me, unfortunately! The only time I remember seeing more than one of these giant worms was after a tall mountain ash tree fell over near the creek. Several worms were hanging from the roots which were now a fair way up in the air. The worms appeared to be at least 1.5 metres (5 ft) long but may have stretched after death. Note: The worms in our area are thought not to be the same species as the well-known giant Gippsland earthworm (Megascolides australis). Some time later, one of our cows fell into an unexpected hole near these roots. She was completely underground with just her head at ground level and was only discovered when the current milking cow was reluctant to leave her. It was a great challenge and took many hours to extricate the cow from the hole. Dad and a couple of neighbours dug a series of steps in the hope that she could be persuaded to walk up out of the hole. She was not at all cooperative until they lowered a bucket of water and she had drunk her fill. Then it was easy. She walked up the steps gingerly at first, then more confidently. Once out of the hole she wandered off to eat some grass, the only external evidence of her ordeal being a scrape mark on her flank. Vegetables were a very large part of our diet. As well as the main farm crops of potatoes, carrots, pumpkin and sweetcorn, we had a garden closer to the house with many other vegetables in season. At various stages, we had broccoli, cabbages, cauliflower, brussels sprouts, okra, peas, beans, broad beans, lettuce, tomatoes, tomatillos, beetroot, silver beet, endive, mizuna, tatsoi, turnips, parsnips, swedes, capsicum, onions, leeks, eggplant, and zucchini. Over the years, there were probably a few more types of vegetables grown than I can remember tonight. One year we even tried growing peanuts! Mum had lots of vases and regularly arranged flowers from the garden in them. Large vases with fairly formal arrangements of flowers and foliage were placed on the plant stand near the window. Cottage-style posies of colourful flowers were in the smaller vases on the table. I remember many ups and downs in my childhood. The walk to school started with a quick trip down the back hill and around the dam, followed by the much slower and longer uphill journey into the town. Shopping was “up the street”. We climbed “up” trees. Visits to our great uncle Harold meant a long steep walk “up” John’s Hill. At night, the chooks had to be “locked up” and younger members of the family were “tucked up”. One year we even saw an echidna crossing the carrot paddock, up the side of one raised bed, across the top, then down into the wheel track, then up, across and down again and again and again. It took a very long while, but the echidna was obviously determined to head back to the cover of the bush in that particular direction! 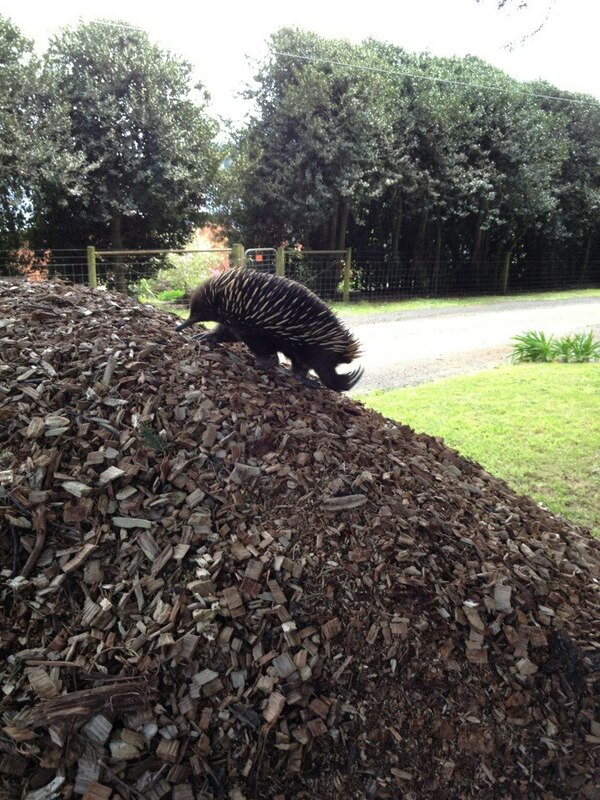 The photo below is of another visiting echidna climbing “up” a heap of mulch on my nature strip just a few years ago. Our garden contained many mature trees, some of which were definitely climbable. There was a lovely copper beech, many tall camellias, a spreading pin oak, maples, lilly pillies and a horse chestnut. Fruiting trees included a patch of plums, lots of apple trees, a lemon, orange, mandarin, several grapefruit and a large chestnut. The two date palms unfortunately never produced viable fruit in our too cold climate! Lots of conifers, including spruce, oregon and pine trees, pencil pines and a range of other cypresses were growing in many sections of the garden. We enjoyed walks amongst the tree ferns on the Tourist Track which meandered beside the Menzies creek at the bottom of the hill. 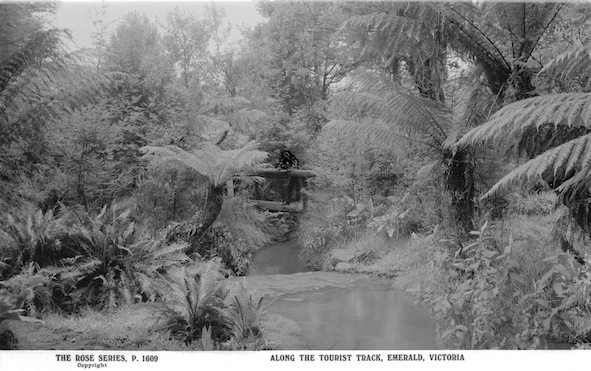 The postcard image below shows an earlier view near the track. By the time we began walking along it, the mountain ash trees were much taller and the area was much shadier. It was important to “keep to the track” as quite a number of deep mine shafts from the gold mining days were (and probably still are) hidden amongst the undergrowth. We heard about a near miss one day. A tree that had fallen across the track was to be removed by the shire ranger. He had cut it with a chainsaw on one side of the track then stepped over the log before cutting the other side. The log then fell down a mineshaft which was right where he would have been standing if he hadn’t changed sides! Mum made often wonderful sponge cakes for morning and afternoon tea. The sponges were made in pairs which were joined with a thick layer of whipped cream then iced and decorated. They were absolutely scrumptious and definitely took much longer to make than to eat! Walking to school in new leather shoes at the start of the school year often resulted in pain and blisters where the shoes rubbed the back of my heels. We had a small flock of about 30 sheep. Most were very placid and easy to round up for shearing, except for the one we called Stamper. If she looked at you and stamped her foot, watch out! Many times we had to round up the sheep again after she had led a breakaway group past whoever she had intimidated that day. Later on, as the local population increased and more dogs were roaming at night, Stamper was the only one able to protect her lambs! Picking up rocks in winter was not fun! It was hard work but had to be done. One of the consequences of changing from horse to tractor-drawn implements was a greater depth of ploughing. In the top section of the paddock behind the cow shed, this resulted in pieces of mudstone being brought to the surface for a few years. Dad did most of the picking up, but my sister and I were roped in to do a lot of it too. After we placed the rocks into banana boxes, they were loaded onto the “carryall” and transported to any section of driveway that needed extra crushed rock. The process had to happen in winter because that was after the previous year’s potatoes had been harvested and before the soil needed to be worked up for the next crop. I didn’t realise that rhubarb leaves were poisonous when I fed them to the chooks one day. Luckily Mum and Grandma found out and removed them before any damage was done! 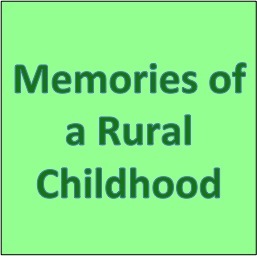 Towards the end of a Church fete, one day, my sister and I had a few pennies to spend – just enough to combine in a guess how many – something – was in a jar. We each made a guess and chose the mean for our entry. Miraculously we won a Royal Albert cup, saucer and plate set. It was carefully carried home and given to Mum. She kept it on display for many years, but never used it. The set is in my possession now. I really should try it out next time I make a “cuppa”! The aroma of ripe quinces is wonderful. The fruits are yellow, generally lumpy looking and have flesh that is hard to cut. The effort of cutting into quinces is, however, worth it in the long run as the cooked fruit is very tasty. We often had stewed quinces, either by themselves or mixed with apples, with ice cream for “pudding”. Very occasionally some of the quinces were stewed, mashed, strained, then boiled with sugar and made into beautiful rosy-red jelly. We loved eating quince jelly on bread or toast. I have two quince trees in my current garden but rarely get much fruit as the white cockatoos eat and knock down most of them before they are anywhere near ripe! That winters in the hills can be very cold is very much an understatement. When I was small the only heating we had was a “Warmray” and the wood stove in the kitchen and living area. The bedrooms were bitterly cold. Hot water bottles helped a bit but layered quilts on top of our blankets were the best protection. Some of these looked rather motley, being made up of a range of recycled fabrics sewn together. These days such quilts are called “Waggas” and are very much sought after by collectors. Very few survive as these utilitarian covers were generally disposed of when worn out or no longer useful.